Almost exactly one year ago, I left the idyllic New England town of Middlebury, Vermont in order to board a plane to Istanbul – a sprawling metropolis of 14 million people and millennia of history. Because of this one-year anniversary, this week I was filled with nostalgia for my time in Turkey. My reminiscing also had a lot to do with my thesis: over the fall semester and during J-term, I was writing my History thesis on the Ottoman Empire’s relationship with Britain in the 1870s. After the triumphant moment turning in the thesis (professionally bound with a sharp-looking title page, thanks to the great staff at the Reprographics office), I kept thinking about how the academic journey of the past five months was largely the result of my decision to study abroad and to go outside my comfort zone. 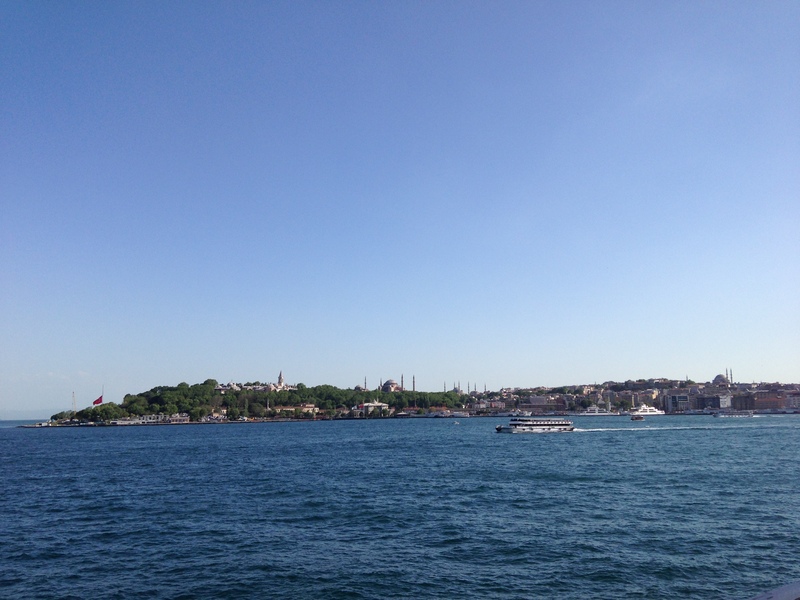 A view of the Golden Horn in Istanbul, the peninsula filled with historic sites like the Hagia Sofia and the Blue Mosque. It is fitting that my journey studying Turkey ends (for now) in J-term, because that is where it all began. During my sophomore year, I took a J-term course called Euro-Atlantic Relations. Taught by a veteran Middlebury Winter Term instructor, the course was a 360-degree look at NATO and the state of the alliance between the United States and Europe. As a part of the course and with the excellent advising of Stan Sloan, the instructor, I undertook a research project into Turkey’s relationship with the European Union. Inspired by the research, I signed up to study abroad in Istanbul. It was a risk in many ways – I didn’t speak Turkish, had never been to Turkey before, and was worried about giving up opportunities for involvement on campus in the spring semester, particularly given my responsibilities as an editor of the newspaper. However, looking back, I am so happy that I made the decision and am always advocating study abroad to other Middlebury students who are weighing similar trade-offs. It’s tough to concisely describe how much I learned in Istanbul. There was the immense amount I learned in courses on Turkish history and politics at Boğaziçi University – knowledge that I relied on time and time again while writing my thesis. I also experienced a great deal of personal growth. 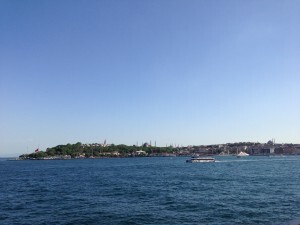 I had never lived in a city bigger than Appleton, Wisconsin for any considerable length of time, and learning to navigate Istanbul, while a challenge at first, had huge rewards. I now feel like I can survive and thrive in a new environment, no matter how big the learning curve in terms of language or culture. I’m hoping to return to Turkey after I graduate this spring. My journey there and back again is an example of how experiences at Middlebury can change you in unexpected and exciting ways. Had I not taken the Euro-Atlantic relations course, I might be remising today about totally different but equally rewarding memories. This entry was posted in Admissions on January 31, 2015 by Joseph Flaherty. One of the four classes that every Middlebury first year takes during their first semester is a first year seminar, a writing intensive class capped at 15 students designed to prepare students for the writing-intensive Middlebury curriculum. Each fall, around 40 seminars are offered for our September admits, ranging from The Art and Life of Andy Warhol to Literature in Exile to The Geology of National Parks to The Story of Geometry. My first seminar, elegantly titled Oratory: Winning the Soul with Words, was one of the most academically transformative experiences of my Middlebury career. Taught by theatre professor Dana Yeaton, the seminar was divided into three parts. During the first part, we read Aristotle’s book “On Rhetoric” and studied the theoretical components of constructing a powerful speech. The middle third of the class was focused on reading great speeches throughout history, from Pericles’ Funeral Oration to Lincoln’s Gettysburg Address to MLK’s I Have a Dream. During the last few weeks of class, we wrote and delivered a number of our own speeches, culminating in a TED Talk presentation. The class was incredibly rewarding precisely because it was unlike anything I had ever done before, or after, for that matter. Since it was the first time he had taught the class, Professor Yeaton experimented with different methods of teaching and various kinds of assignments. He always brought an energy to the room that made the 75 minutes fly by in the blink of an eye. And because of the personal nature of our final TED Talks, the 15 of us got to know each other very well by the end of the semester. In the January following that fall semester, Professor Yeaton invited a few of us from the seminar to participate in the College’s annual Martin Luther King Day Celebration in Mead Chapel, an evening of song, dance, and oratory that commemorates the life of the civil rights hero. Together with a few other theatre students, we performed a condensed reading of MLK’s famous I Have a Dream speech. Relying on the projection of our voice and the acoustics in the chapel, we tried to capture, without microphones, the cadence of King’s speech and project its power to the standing-room only crowd. We even added a touch of Middlebury flair by reciting one section of the speech in various foreign languages. This past Martin Luther King Day, I returned to the chapel to watch the oratorio for the first time since I participated in it three years ago. Professor Yeaton helped direct the show again, this time with students from his Speechmaker’s Studio J-Term class and members of the newly formed Oratory Society. Together, they read a series of quotes from MLK and other civil rights leaders to begin the show and like us, performed a reading of the I Have a Dream speech. Sitting in the pews, with a tinge of nostalgia, I felt incredibly proud of how much Professor Yeaton’s oratory program has grown at Middlebury. This was the second year in a row that he has offered the Speechmaker’s Studio as a J-Term class, attracting students ranging from political science majors to varsity skiers to international first years. His Oratory Society hosted an “oratory slam” in the fall and conducts workshops open to anyone wishing to improve their public speaking skills. In his quest to bring public speaking to the fore of the liberal arts curriculum, Professor Yeaton has struck a chord with students who recognize the importance of that skill in today’s digitally connected world. The oratory program is yet another example of how the liberal arts continues to evolve here at Middlebury. This entry was posted in Uncategorized on January 31, 2015 by Qian Zhe Zhang. Smack dab in the middle of the winter, when wind is brisk but the views are breathtaking, you might think the best way to enjoy the winter is snuggled up with tea, looking out your dorm room windows. While this is more than lovely, J-term is really the best time to get out and have fun! And I don’t necessarily mean outside (so you don’t need to worry about frostbite). Because we only take one class during J-term, we all have tons of free time to attend Middlebury-sponsored events or bring our friends together in a way we don’t usually have the time to. Just last night, my housemates and I attended an etiquette dinner hosted by our Center for Careers and Internships. We all dressed up in our most dapper business-casual attire and learned all of the proper steps of buttering your bread. While this may seem silly, it was a wonderful opportunity to spend times with my friends in a completely new environment that was a little challenging but ultimately came with a delicious catered meal. And it just gets better from there! Not only do we all have extra time to go to sponsored events, we can put on our own little luncheons such as Thai Thursday. While my housemates and I usually have class on Thursdays, we took J-term time to spend the afternoon together off of campus in our greater Middlebury community. Lunch in the dining hall with friends is wonderful, but getting together to plan something different is truly special. If you want to go even further, if a lunch trip into town just doesn’t seem like enough, J-term classes often aren’t five days a week, so day trips become far easier than they are during a typical semester. This week, my housemates and I are planning a trip to a small Vermont cheese-making factory. I can’t image anything better than eating cheese with my best friends. If you can, I’m in! J-term is one of the most exciting parts of going to Middlebury. At first, you have so much time to read for pleasure, you spend all of your time in your room reading young adult novels (or at least that’s what I did), but then you see that you have been given an amazing opportunity to spend time with your friends in whole new ways. Whether you’re faking your way through an etiquette dinner or tasting cheese, J-term is nothing but fun and surprises! This entry was posted in Student Life on January 22, 2015 by Stevie Durocher. It’s that magical time of year here at Middlebury – it is J-Term! It is time to adventure (and stay inside), it is a time to dive into a topic (and then go for a ski break), and this year it is a time to eat cheese! Okay. Let me back up. J-Term is this magical time of year because Middlebury ensures you will not only survive but also enjoy a Vermont winter. As a Floridian, you have my word that, although it feels like -17 oF tonight, I have a smile on my face and I am having fun. This J-Term I am working on my senior thesis in the chemistry department and auditing Prof. Murray Dry’s class Love and Friendship. So I get to read Plato, Aristotle, Shakespeare, and Tolstoy (and more) in addition to the Journal of American Chemical Society. A very well-rounded semester, I like to think. But J-Term is also magical because of the few extra moments everyone (typically) has in his day. As Middlebury students, we usually try to fill up those 24-hours with as much as possible, even if just for a month long commitment. So naturally I – on top of my thesis and auditing a class – signed up for a J-Term workshop (go.middlebury.edu/wtw). Workshops are non-credit bearing mini-classes that are run by students, faculty, or staff who want to share their passion. They can range from learning how to whistle to….eating cheese! Well more specifically this J-Term I am signed up for an “artisanal cheese tasting” workshop. It is taught by Linnea Burnham, a senior at Middlebury who loves cheese. Way more than me. She could not stop smiling the entire hour tonight while me and 8 other Middlebury students tasted “hard alpine cheeses” and learned how to talk about them and how to go about smelling and tasting them. And then once we tasted the 6 cheeses she brought in, we kept eating good cheese. Linnea I must say was very qualified for the job. I had never met her before, but learned that she is a French/History double major writing both of her theses on cheese in 19th Century France! She also spent this past summer making cheese in France (she brought some of that cheese with her tonight), and her childhood is somehow affiliated with dairy farming (I missed the actual story). I was very impressed and look forward to two more Wednesdays with Linnea and her fabulous cheeses. This entry was posted in Uncategorized on January 7, 2015 by Staci Hill.